What better way is there to get through the cold winter months than with some stickers on traveling to sunshine and palm trees? If you're scrapbooking after a trip or just want stickers for fun, we've got your travel stickers covered! 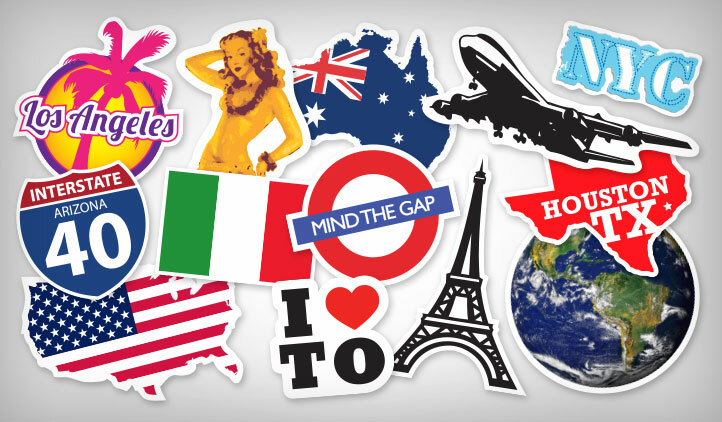 Toronto, New York, Las Vegas, Hawaii, or Paris… whether you’re traveling or dreaming of traveling, you can make all your favorite travel stickers right here at StickerYou! For a fun way to easily spot your suitcase, when your bag drops down after a flight, stick stickers on your suitcase of where you want to go, or famous landmarks from the different places you’ve been like palm trees, the CN Tower, or the Statue of Liberty. If you’re feeling creative, make your own luggage tags, with a custom sticker of your making to stick on the tags. For scrapbooking from a great trip, include different icons, flags, or the I heart stickers. Make a variety of different travel icons, flags, and more as a bumper sticker, stick on mugs, laptops, bedroom doors, notebooks, or stick them on photos after trips! If your stickers are for a trip, write the travel dates or who you traveled with, on your stickers either as you’re making them, or when they’re ready with a pen or marker.